This old log cabin church is actually a restoration using salvaged timber from vintage barns. The church had been in existence from 1856 til 2006 when some dirtbag arsonist decided to burn the place to the ground. Rumors of it being haunted however have become something of local lore, with the usual urban legend type stories of alleged “black rites” and other nonsense having taken place there. This place is probably haunted only by its wealth of years, and an act of cowardly arson. Its the scariest place I’ve ever been to, I constantly felt like I was being watched. At one point I even felt a rush of cold air sweep through my body even though it was like 85 degrees outside. Also as we went down to the bridge and shut our vehicle off, we could hear screams and cries, and our car even got pushed across the bridge. At first we didn’t believe it, but then we turned around and shut the car off and put it in neutral we were pushed again. We immediately left as fast as we could. I’ve had a few experiences at this place from hand prints all over car to my antenna moving for no reason my phone wouldn’t record any voices not even my own and as soon as I left it worked also birthday card started singing and u have to open and close it all the way for it to do so it was laying on the floor of car very creepy place! My friend Laurel and I went yesterday. The church was very creepy. We walked around the graveyard. A creepy truck drove past and slowed down. We got some great EMF evidence. However, as we were looking at a grave stone we heard a shotgun shot right across the street! We freaked out! We sucked down, then came 2 more shots! I wanted to run away from the shot back to the church and my friend wanted to run towards the shot to the car. We booked it for the car and got out of there! BE CAREFUL if you go! Please! 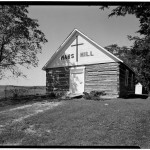 I don’t see what’s so scary and creepy about Mars Hill. So you can here babies crying at Cry Baby Bridge. And you vehical will die if you cross to slow. So did any one see civil war soldier that stands next to the tree to at the cemetery? How about the other spirits there? I guess when you see/ talk to them on a daily basis. Mars Hill isn’t close to being creepy/ scary. Just saying!!!!!! My 1st time here was in the end of the 1970’s and it was very haunted and spooky then and I am returning again this month and I can’t wait. My uncle Jesse ended up with stitches in his hand the first time we went with very spooky sounds, cries, weird lights and we were also locked in the church with no one outside. I remember hiding underneath the Church pues and it being freezing cold in the summer. My two cousins wetting themselves in fear. I guess I am a fear seeker that’s why I am going back for more. It is real and yes it was burned down but then rebuilt but the cemetery still remains too right next to it.